Find out how simple Rosemary and the power of Herbal Medicine can change your life! Successful paralyses treatment now available with Stem Cells! Not the first case but this young man is a lot more happy now! Free seminars available to understand what stem cells can do for you! Its not just disease and stress that causes us to age prematurely but the simple decline in numbers and quality of our stem cells. Now you can combat brain-fog and aging with Stem Cell Therapy in Kitsap County! Why wait until you get the heart attack? Keep your heart healthy and prevent the #1 diseae that kills. Regenerative Medicine is the key to longevity! We offer comprehensive wellness packages to combat aging! Click here for more info and seminars! Stroke Recovery with Stem Cells in Kitsap - Don't take a chance! Stroke Recovery with Stem Cells - Don't take a chance! Acupuncture for Stroke Recovery is now standard in China! Why not here in the US? Now we add Stem Cells and we are able to treat the most difficult cases of stroke. Full recovery programs available at Kitsap Stemcells! 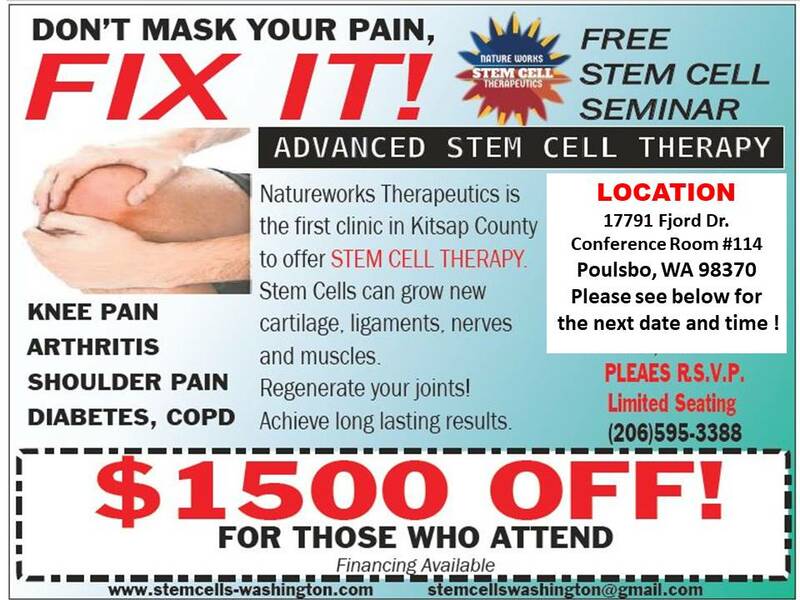 LIVE DRUG AND SURGERY FREE with our Stem Cell Therapy in Kitsap County! The combination of Acupuncture, Chinese herbs, Tui Na medical massage, Qi Gong, Nutrition and now Natural Stem Cell Therapy deliver a comprehensive approach to health of the WHOLE BODY. health insurance for $45 now - Kitsap County - save money for real Medicine! A new insurance is on the horizon...for $45 you can have a great catastrophic insurance and You will have so much money left over to really take care of your health with Chinese Medicine and Stem Cell Therapy. Rejuvenating Stem Cell Therapy now available in Kitsap County! Not all bank accounts are created equal. Some people are able to enjoy health and longevity despite very unhealthy lifestyles, while other people may enjoy neither robust health nor longevity despite healthy lifestyles. In other words, some people are able to “spend” their stem cells more extravagantly than others, simply because they have more to spend. Most of us fall somewhere in the middle, where both the length and the quality of our lives may be influenced to some degree by our choice of lifestyle. Environmental factors also play a key role in determining how rapidly one’s “bank account” of (adult) stem cells is depleted. However, even under ideal circumstances, stem cells continually diminish with age. Our stem cells exist in every part of the body to repair damage, such as from broken bones, a paper cut, radiological or chemical exposure, etc., all of which require stem cells for healing. You may draw on your bank account at any time, whenever you need to do so, until you run out of stem cells. As your “bank account” of stem cells approaches zero, physiological healing will become increasingly difficult, until finally it ceases altogether. This is were rejuvenating Stem Cell Therapy comes in. We get you back on track. Help repair damaged body parts, reduce inflammation, fix your digestions and help you live pain free and longer! Here is a publication on a recent study. Today we have much better and safe stem cell available! Schedule your Virtual Chinese Medicine Consultation here! No need to come into the office. We will setup a consultation time on the same day, intake all your medical history and provide you with a proper Chinese Medicine Diagnosis. We will then mail your Herbal Formula directly to your home and provide you with all other necessary nutritional and other health advice to get you back on track! We now offer complete Stroke Recovery Program In Kitsap County. The combination of Stem Cell Therapy and Chinese Medicine now treats and speeds up the recovery of an Ischemic Stroke. Trials concluded that rtPA and stem cells given within 6 hours of a stroke significantly increased the odds of being alive and independent at final follow-up, particularly in patients treated within 3 hours. No matter how far along the stroke recovery, brain repair can be stimulated. Acupuncture treats Pain! The most comprehensive study ever! Our results from individual patient data meta-analyses of nearly 18,000 randomized patients on high quality trials provide the most robust evidence to date that acupuncture is a reasonable referral option for patients with chronic pain. Don't wait for your Health to deteriorate even more. Enjoy your life again and feel even better than EVER! Heal your injuries at record speed and avoid unnecessary surgeries! Read here for a full list of SCIENCE articles. Brand new RESEARCH is now revealing how inflammatory Arthritis is getting treated by stem cells. Here is a live Radio Interview about NatureWorks new Stem Cell Therapy! Check it out! Bernhard Langer with has 62 career PGA wins and recently won his 10th senior major. An achievement that no other professional golfer has done before him. Hans-Thomas had the privilege to meet Bernhard, a fellow German country man, at the Boeing classic 2017. The Golf legend received two acupuncture treatments from Hans-Thomas during that week and we spend time together on the Golf course. It was an honor to be able to meet Bernhard and watch his impressive practice regiment. Success comes from hard and dedicated work! 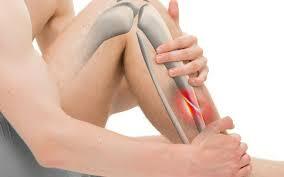 Now you can avoid costly and painful artificial joint replacements. Even if the Osteo-arthritis condition is advanced there is always some natural cartilage left in the joint. Cartilage has limited repair capabilities: Because chondrocytes are bound in a small space, they cannot migrate to damaged areas. Therefore, cartilage damage is difficult to heal. Also, because hyaline cartilage does not have a blood supply, the deposition of new matrix is slow. The Stem Cells Tissue source we use is ideal for the the restoration of damaged or arthritic joints. Adipose tissue stem cells, cortisone injections, and other medicines offer a temporary cure for some of these injuries or diseases; while amniotic stem cells have the capability to restore the regenerative tissue and bone back to its original condition. One of the prime components of amniotic stem cell therapy is the hyaluronic acid that is known to lubricate your joints and tendons, easing pain and restoring your mobility. Several weeks after injection of the amniotic stem cells a significant improvement in cartilage growth, ligament and tendon stability can be noticed. In addition, the stem cell therapy provides a natural boost of cartilage growth due to the inclusion of over 200 growth factors and cytokines that stimulate cellular regeneration. Cartilage provides a cushion and lubrication between the knee joint. with age this cushion erodes and causes more friction and pain. stem cells will allow the re-growth of this natural tissue. NOW Offering FREE QI GONG classes twice a week. Currently Tues 4:30 pm. Please Email because space is limited. Hello, by poplar demand I changed my Qi Gong class time to 1pm on Mondays! Come and check it out at the Poulsbo Athletic Club! NOW Offering Qi Gong classes at the Poulsbo Athletic Club! See Blog for details!